The next big gaming franchise from the creators of a decade and a half's worth of some of the Playstation's most beloved titles is coming to the Xbox 360. Insomniac Games, the studio behind Spyro the Dragon, Ratchet & Clank and Resistance, unveiled a deal this morning with Electronic Arts that will put their still unannounced, undated next franchise on the Playstation 3 and Xbox 360. Under the agreement Insomniac will retain ownership of the intellectual property. "There have been a lot of great reasons to make games for the Playstation," said Ted Price, founder and CEO of Insomniac Games. "We have a wonderful relationship with Sony and will continue to work with them on Playstation titles." While Insomniac Games' growth as a developer has been steady, it hasn't seen any big spikes, Price told Kotaku. Making a game for multiple systems means that the developer and its games will be able to reach a broader audience. "We never wanted to limit ourselves," Price said. "People are inspired here by having the opportunity to try new things. (Playstation 3 shooter) Resistance was a chance to branch out and we will continue to look for those opportunities." The latest chance is bringing Insomniac Games' upcoming, all-new franchise set in a new universe to the PS3 and Xbox 360. The title is currently in production at the company's Burbank studio, but Price remained tight-lipped about what it was. "We've never approached any of the games we make as one-offs," Price said. "Our goal is to create a franchise." Price declined to specify the sort of game it would be, adding that the developer won't be talking about it at this year's E3 next month. He did say that Insomniac currently has "multiple teams working on multiple projects." We've heard that Insomniac Games has agreed to produce at least one more Ratchet & Clank title and perhaps two more Resistance games. Price declined to confirm those details, but did verify that his company is still working on both franchises. "We are going to continue to support Ratchet and Resistance," he said. "I think (PS3 owners) will be happy with what we have coming." Rumors of Insomniac breaking their 16-year tradition of creating games exclusively for the Playstation first surfaced during the Game Developers Conference earlier this year. Craig Rechenmacher, vice president of marketing at EA Partners, said the discussions with Insomniac started "pretty organically." 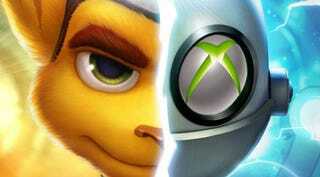 Rumor: Ratchet & Clank Devs Going Multiplatform? "We have relationships with everyone," Rechenmacher said. "This is one we've had our eyes on forever." "Our goal is to work with the best and brightest game developers"